It is up to God to put one down and raise another up, it is He who is judge in the earth and He alone will allow the horns (mouths) of His anointed who do righteousness to be exalted while the mouth of the wicked will be cut off. (Psalm 75:4-10) I said unto the fools, Deal not foolishly: and to the wicked, Lift not up the horn: Lift not up your horn on high: speak not with a stiff neck. For promotion cometh neither from the east, nor from the west, nor from the south. But God is the judge: he putteth down one, and setteth up another. For in the hand of the Lord there is a cup, and the wine is red; it is full of mixture; and he poureth out of the same: but the dregs thereof, all the wicked of the earth shall wring them out, and drink them. But I will declare for ever; I will sing praises to the God of Jacob. 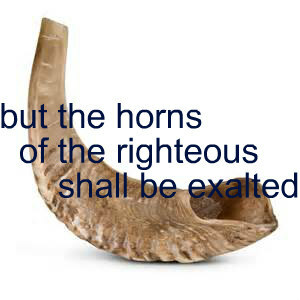 All the horns of the wicked also will I cut off; but the horns of the righteous shall be exalted…….. (1 John 2:27-29). Even the prayer of Hannah who was the mother of Samuel spoke of what God is capable of accomplishing in the earth as He will keep the feet of His saints and the wicked will be put to silence. (1 Samuel 2:1,6-10). Sound the Shofar for the HOLY LAND of Israel-Yisrael and our Judeo-Christian Nation United States of America! !